42 years of Cosmic Encounter; find new Havens with Red Raven’s latest game, and 90’s classic City of Chaos gets new life. Commemorating the 42nd Anniversary of Cosmic Encounter, the chaotic space of strategic negotiation, alliance, and betrayal. 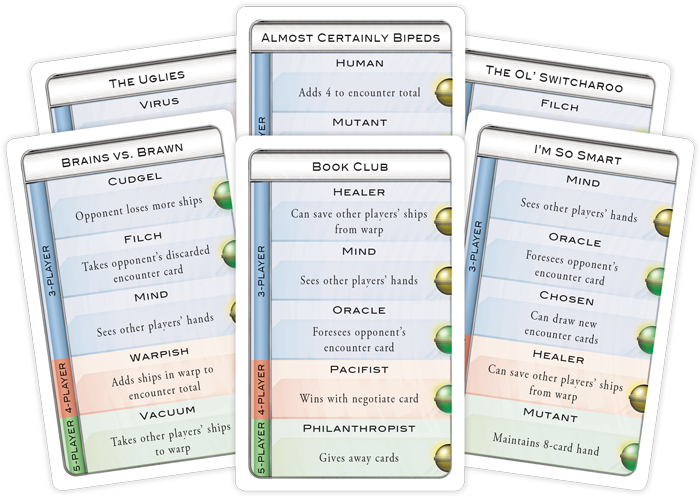 Remaining fully compatible with all previous publications of Cosmic Encounter including expansions, the 42nd Anniversary Edition features a revised rulebook, new graphic design and ship components, new aliens, a Quick Start Guide, and most anticipatedly – a ‘Suggested Alien Combinations’ deck. Cosmic Encounter 42 releases in the 3rd quarter which is FFG speak for ‘Gen Con.’ – now’s a great time to pick up any expansions you may be missing as they will remain 100% compatible with the game, life, the universe, and everything. The forest’s Guardian Spirit sleeps deeply and can no longer protect his kingdom. One of you controls the City in an effort to master the vulnerable forest using iron lore and machines. The other plays as the Forest and its creatures who attempt to defend their home with the aid of leaf lore and forest spirits. Details are otherwise light, but the game is rocketing towards an October release so it’s probably all wrapped up. Red Raven Games has been on fire recently with their latest titles Empires of the Void II and Near and Far becoming massive critical and sales successes, with the latter’s expansion coming this month. City of Chaos was a ginormous board game of an eccentric, imaginative city and the stories that lay within. We’ll bring you more on City of Chaos as it goes live. This week we’ve got some unorthodox (but excellent!) stuff for you. Read previews of the book here and hit up the KS page here. Heroes of Land, Air, and Sea was a huge hit last year – now the reprint is in! Along with the base set, the new box Order and Chaos features Lionkin, undead, lizardfolk and goblins while the Pestilence box adds Birdfolk and Merfolk which begin in the air and underwater respectively. Explore, expand, exploit, and exterminate your way to victory in this real-time strategy inspired game of resource management and conquest. KS page is here. Command and Colors. Battlelore. Battles of Westeros. Now designer Richard Borg takes to orbit with Red Alert: Space Fleet Warfare. Featuring almost a hundred ships in the base box with plenty of options for additional buy ins, Red Alert: SFW looks like it’s going to scorch the stars. And that’s it for the news brief! Thank you for reading. In commemoration of Cosmic Encounter, check out our list of some of the very best board games set in outer space.